Western blot analysis of cell extracts from various cell lines using beta-Actin (13E5) Rabbit mAb. 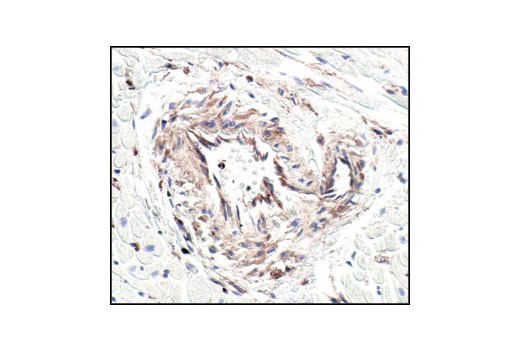 Immunohistochemical analysis of paraffin-embedded human heart using beta-Actin (13E5) Rabbit mAb. Note the lack of staining of cardiac actin. 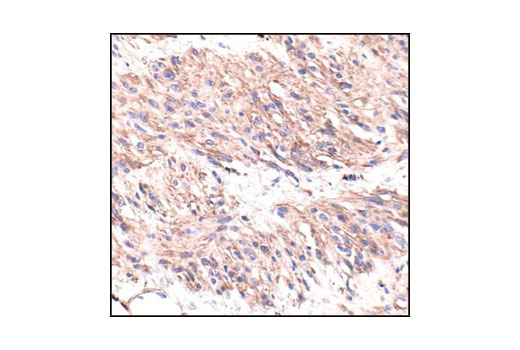 Immunohistochemical analysis of paraffin-embedded human leiomyoma using beta-Actin (13E5) Rabbit mAb. 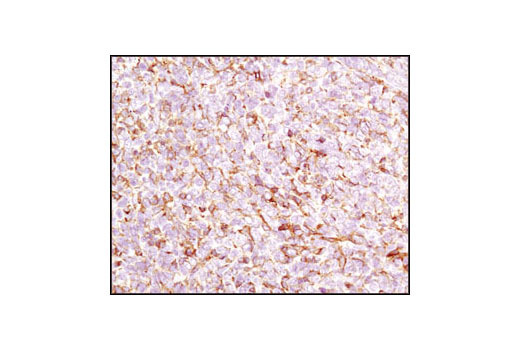 Immunohistochemical analysis of paraffin-embedded 4T1 syngeneic mouse tumor using β-actin (13E5) Rabbit mAb. 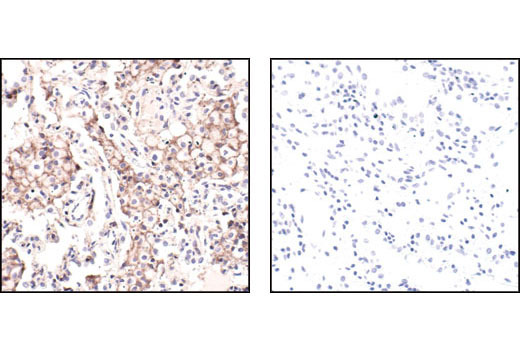 Immunohistochemical analysis of paraffin-embedded human lung carcinoma using beta-Actin (13E5) Rabbit mAb in the presence of control peptide (left) or beta-Actin Blocking Peptide #1025 (right). 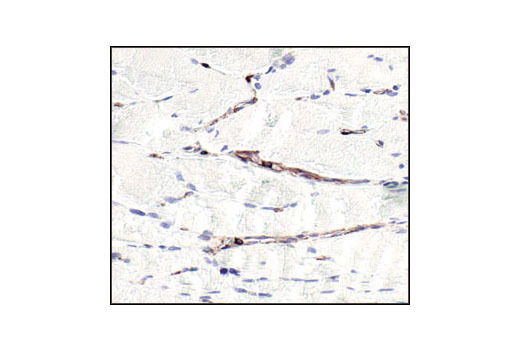 Immunohistochemical analysis of paraffin-embedded human skeletal muscle using beta-Actin (13E5) Rabbit mAb. Note the lack of staining of skeletal muscle actin. 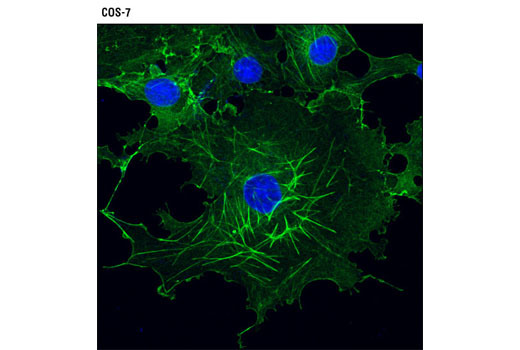 Confocal immunofluorescent analysis of COS-7 cells using β-Actin (13E5) Rabbit mAb (green). Blue pseudocolor = DRAQ5® #4084 (fluorescent DNA dye). 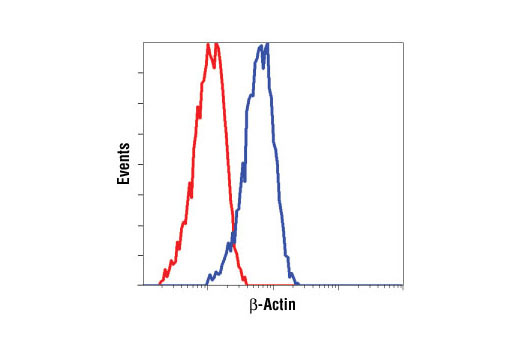 Flow cytometric analysis of NIH/3T3 cells using β-Actin (13E5) Rabbit mAb (blue) compared to a nonspecific negative control antibody (red). 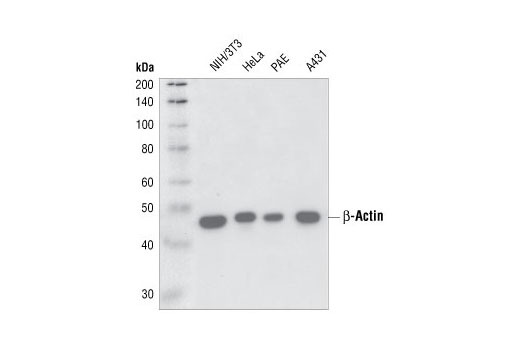 β-Actin (13E5) Rabbit mAb detects endogenous levels of total β-actin protein. This antibody may cross-react with the γ-actin (cytoplasmic isoform). It does not cross-react with α-skeletal, α-cardiac, α-vascular smooth, or γ-enteric smooth muscle isoforms.